Easy, pretty, and waiting to be eaten! The holidays are approaching, and I LOVE making and giving gifts from my kitchen! I’ve been working on a whole bunch of giftables, and will be posting lists (with recipes) of all those delicious things soon, so that you can also get your kitchen gifting on! 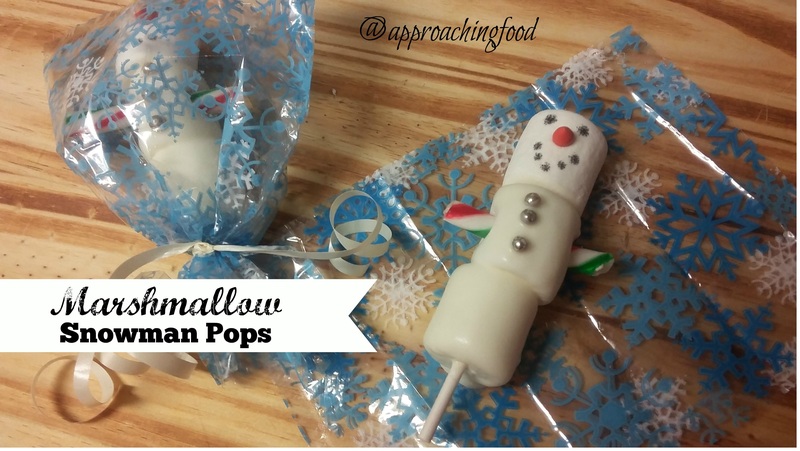 This week’s recipe is one of those giftables: Marshmallow Snowman Pops! Marshmallow Snowman Pops are a simple last-minute gift that you can pull together to hand out to children, or to tie on to a holiday gift. I made several of these last week and gave them to the children who were at a holiday party I was attended. They ate them right away, which flattered me no end! Take the white chocolate wafers and melt them in a bowl in the microwave. Dip the stick (with the two marshmallows on it) in the melted chocolate, turning to coat, until the marshmallows are all covered in chocolate. Then dip the top of the stick in the melted chocolate, and stick the third marshmallow on top. (The chocolate functions as a sort of glue to keep the top marshmallow on.) FYI, it’s easier to cover the marshmallows in chocolate when you’re melting the wafers for several marshmallows. Take another cake pop stick (or chopstick, which is what I used), and push it through the centre marshmallow where you want the snowman’s arms to be, then remove it. Place the marshmallow and chocolate stick on a plate and stick it in the fridge until the chocolate is mostly set. Take the candy cane, and snap off the curved part, so that you’re only left with a straight stick of candy cane. Push this straight stick through the hole that you previously made for the arms. Place the silver dragees on the centre marshmallow where you want the buttons to be. Place snowman in fridge until chocolate is completely set. Using another cake pop stick, pop a hole in the top marshmallow, where you want the nose to be. Stick the orange candy-covered sunflower seed (or other orange candy resembling a carrot) in the hole. Using your food colouring markers, draw on eyes and a mouth. And voila! An adorable and easy gift! I wrapped mine up in cellophane bags and used curling ribbon to tie them shut. Gift them to others and wait for the oohs and aaahs! Next Post: I know I promised last time to give you a recipe for Super-Easy Strawberry Cranberry Jam, but that’ll have to wait a bit, because the next post is Five Easy Holiday Gifts that You Can Make in the Kitchen! This entry was posted in Desserts Not Otherwise Categorized on December 11, 2017 by Margaret. That looks awesome, and so cute! This is great! This I will do for my son Dustin. He is the only one in the family who loves marshmallows and will eat them straight out of the bag, even if they are stale. I must make one for him, even though he is not a child.